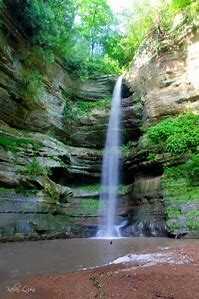 Starved Rock State Park is a world apart from anything else in Illinois! You will know it the minute we enter the park as we travel through tree-covered sandstone bluffs to the remarkable Starved Rock Lodge. This beautiful park attracts over 2 million visitors annually to explore its scenic trails and 18 canyons, view its amazing waterfalls, dine in its historic Lodge and enjoy the panoramic views from tall bluffs. We’ll spend a night in the Lodge which was built in the 1930’s. The Lodge features a huge double-sided fireplace, rustic hand-cut knotty pine logs, and is on the National Register of Historic Places. If you choose to explore the Park’s beautiful scenery on a peaceful hike there will be time to do so. Planned activities in and around the Park include a show by the Nashville Connection – country music at its finest! Dave and Daphne, a Nashville duo, perform a high- energy show with classic country music roots! Dave was Barbara Mandrell’s lead guitarist for over 10 years. Daphne was Southern Gospel Music’s Female Vocalist of the Year, having spent many years with the Bill Gaither Southern Gospel Music Show. She is best described as a cross between Shania Twain and Patsy Cline. Together, they bring country legend favorites like Loretta Lynn, Willie Nelson, Patsy Cline and so many more, to create an afternoon of Nashville fun. We’ll enjoy a scenic boat cruise on the picturesque Illinois River, take a Trolley Tour of Starved Rock State Park, and visit the amazing Weber House and its fabulous English Gardens. Four delicious meals at Starved Rock, deluxe motor coach transportation, luggage handling, and a tour guide are also included. Minimal walking is required with some optional hikes in the Park. Full payment is required by APRIL 15, 2019.